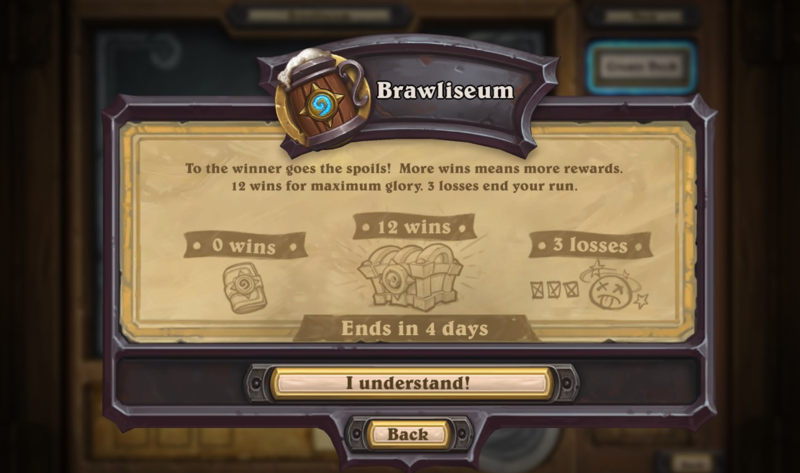 Your Standard Brawliseum Has Taken Over Tavern Brawl This Week! Welcome back, gladiator! Build a deck for Standard format this time and compete for glorious prizes! This is the fourth time we are seeing the standard version of this brawl. This brawl is much like past Heroic Brawls but instead uses the Arena reward structure. One free entry to the brawl is given to all players. THIS IS TAVERN BRAWL #200! This Tavern Brawl is a cross between what we're used to seeing for Heroic Brawls and bits of Arena. You will pay an entry fee equal to an Arena run to take part in this Tavern Brawl. Using cards in your own collection, you build a deck for the standard format. Like Arena or a Heroic Brawl, once you lose 3 games in the Standard Brawliseum you are out. Rewards will be given to players based on their performance with their deck, equal to the Arena reward structure. Your first run of this brawl will be free! There's nothing to lose! Whizbang for Fun and Profit! Last time around, there was a lot of interest in playing the brawl with Whizbang so if you're looking for a cool deck to test out new cards while getting sweet rewards, look no further! Golden Whizbang recommended for maximum fun. Using our deckbuilder, you can share your decks and strategy for this week's brawl. Use the deckbuilder normally but when saving your deck, make sure you change the Deck Type to "Tavern Brawl" and the brawl to "The Standard Brawliseum". Following these instructions will help other players find your deck. Don't forget to include screenshots to show proof of your wins and losses! Going to be experimenting with some new decks and see how far they go. Come hang out! Hey there, do you mind sharing with me your list for this control bomb warrior? Thanks so much :) !! For your hindsight, that joke was neither constructive nor funny. Actually went 12 wins with summon mage. Whoever posted that comment to include Acidic Swamp Ooze, Harrison Jones and Archivist Elysiana is a genius. Went 8-3 with a self made Oblivitron mech hunter. Unfortunately in the last game I got highrolled by a bomb warrior who had dr. boom mad genius on 7, followed by blastmaster boom on 8, followed by me drawing 2 of the four bombs in my deck. Had some cool highlights thanks to my weaponized pinatas, one of which gave me an additional oblivitron, which pulled my own oblivitron, which summoned mechanical whelp, preeetty good. As a Wild player, this is the first time i have no idea about how to choose and build a Standard deck. I think, that's not how it will work. I think you will just get the prizes for your wins and "lose" the arena ticket when the brawl ends. Oh, you're playing bomb warrior or a rogue that has RNG on their side for card steals? have 12 wins. Just finished this brawl 12-2 as a shaman, almost lost to a rogue that drew 5 (5!) perfect cards and to a bomb warrior that magically drew 4 bombs in 1 turn. Foresight - this meta is going to be pure cancer until the next expac releases.